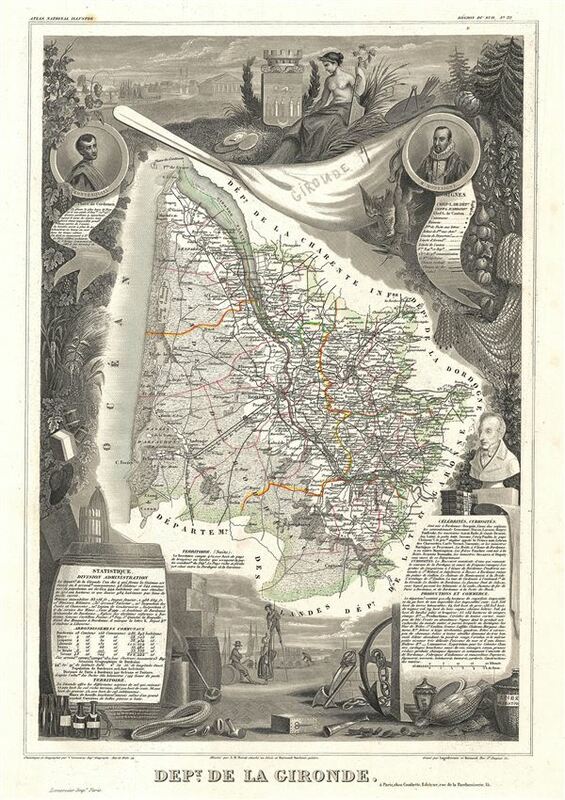 This is a fascinating 1852 map of the French department of Gironde. This coastal department is the seat of the Bordeaux wine region and produces many of the world's finest reds. Shows numerous vineyards and chateaux. The whole is surrounded by elaborate decorative engravings designed to illustrate both the natural beauty and trade richness of the land. There are statistics and a short textual history of the regions depicted on both the left and right sides of the map. Published by V. Levasseur in the 1852 edition of his Atlas National de la France Illustree. Levasseur, V., Atlas National Illustre des 86 Departements et des Possessions de La France Divise par Arrondissements, Cantons et Communea avec La Trace de Toutes Les Routes, Chemins,de fer et Canaux., 1852 edition. Rumsey 0427.032 (1856 edition). Phillips (Atlases) 3003.